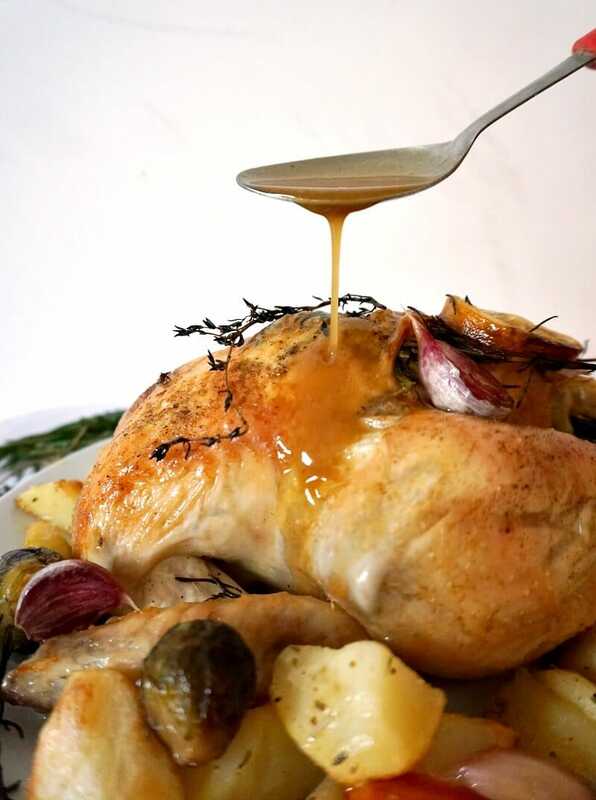 Learn how to roast a whole chicken to perfection and have all your questions answered, plus a delicious recipe of Roast Chicken with Lemon, Thyme and Rosemary, and lots other fantastic recipes of roast chicken, side dishes and gravy. Not sure how to defrost a whole chicken, how long to roast the chicken for, what’s the best temperature? You’ve come to the right place. I have always liked chicken, cooked in any possible way. But ever since I moved to the UK, the roasted chicken has become my favourite dish. The Sunday roast is the very heart and soul of the British food, and it has a tradition that goes back centuries. Definitely, my kind of food. It has everything one would ever ask for: tender meat, gorgeous veggies and finger-licking gravy. More than a meal, this is a proper feast. I always end up eating more than l should, to the point where l feel l’m about to explode. Self-control is right out the window when it comes to a glorious Sunday roast. I’m not be to blamed, really, it’s too delicious! 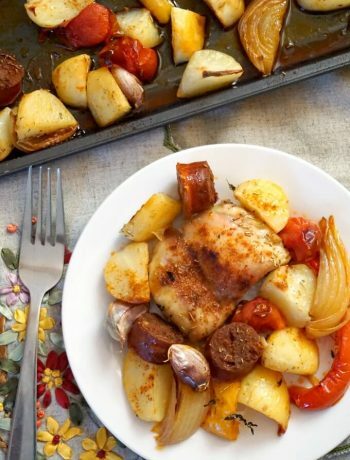 Yes, there are other kinds of meat that people might prefer over chicken when it comes to a good roast, but let’s face it, chicken is the most popular meat all over the world. It’s cheap, easy to cook, and in general not many people fuss when it comes to chicken. Surely, it shouldn’t be too complicated to roast a whole chicken. It is not, most certainly, but there is a right way to do it like a master chef, and have the whole family praise you every single time. So, how to roast a chicken then? So, here is the beast. It’s not a huge one, since I’ve got a small family, myself, my husband, a two year old girl who is a notorious fussy eater, and a 8 month old girl who likes food, but then, how much roast chicken can a 8 month old baby eat?! So, I really have to keep it small, and usually still have leftovers for some other dishes. 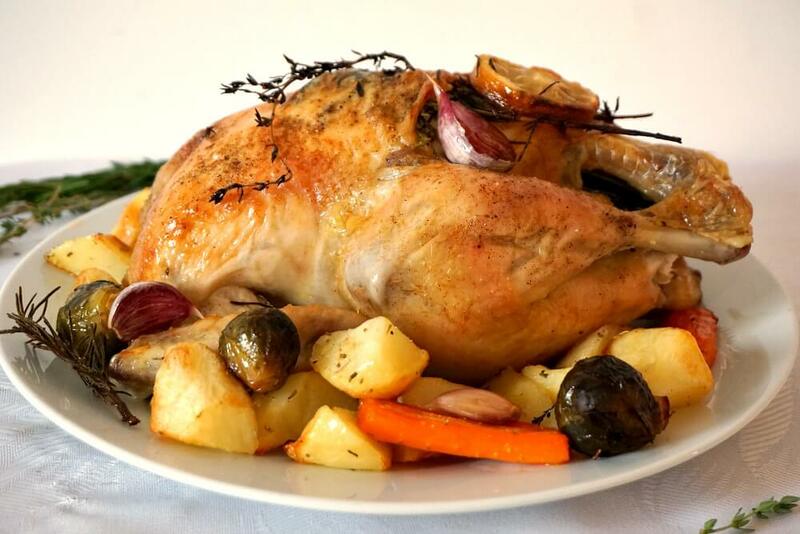 Roast chicken is a great alternative to turkey on Thanksgiving, Christmas, or any other special occasion. Especially if. like me, you don’t have a large family. No point in buying a 20-pound turkey, I mean, the leftovers will probably be enough to feed half of the town. Yes, there are loads of dishes to cook with leftovers, but still. One thing I have learnt after roasting chicken and vegetables several times is that buying a cheap roasting tray that can be thrown away straight after, can save one’s sanity. I absolutely hate doing the dishes, and scrubbing a roasting tray is out of question for me. Fair enough if it’s easy to do it, but, in general, it is not. So, first of all, BUY A DISPOSABLE ROASTING TRAY!!! Almost any shop would sell them, especially around big holidays. Use it, throw it, job done, everybody’s happy. Call me lazy, but I’d call it being efficient. Especially when you have two little monkeys who are demanding, and most of the time, are all over the place. If you use a refrigerated whole chicken for your roast, nothing simpler. Just take it our of the fridge at least 30 minutes before roasting, so it can be at room temperature. This will unsure it roasts evenly. But if you use a frozen one, the best and safest way to defrost it is to leave in in the fridge overnight. The chicken needs about 10 hours per kilo, or 5 hour per pound to defrost in the fridge. The larger the chicken, the longer it takes to thaw, so some good advance planning is needed. I know there might be people saying that it is also safe to thaw the chicken in cold water, as it takes less, but I am all about safety first, so I wouldn’t recommend it. NEVER EVER FREEZE THE CHICKEN AGAIN ONCE IT HAS BEEN DEFROSTED, even if it looks fine. Leave the chicken in its package and place it on the bottom shelf of the fridge. And most importantly, if the chicken has the slightest smell, again, DO NOT COOK IT! Better safe than sorry, I would say. I might be a bit paranoid here, but as I have two small children, I cannot possibly take such a risk. As a general rule, cooking time depends entirely on the weight of your chicken. It takes about 45 minutes per kilogram, or 20 minutes per pound, plus 20 minutes extra. The chicken I used in my recipe had 1,2 kg or about 2.65 pounds. I cooked it for 75 minutes and it came out perfectly. The meat MUST NOT BE PINK! Now, if you cook it for 10-15 minutes longer, it’s not a big deal. I’d rather cook it for longer, than having it undercooked. If you cook the chicken properly, you can be sure that any bacteria would be killed, so never ever eat it if not done properly. No one wants to get a nasty food poisoning. Also, don’t rinse the chicken once you take it out of the package, you don’t want to splash any bacteria around. Just season it, and stuff it, if you choose to, and then straight in the oven, no need to have it around for too long. 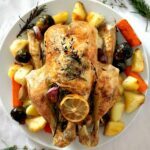 WHAT IS THE BEST TEMPERATURE TO ROAST CHICKEN? 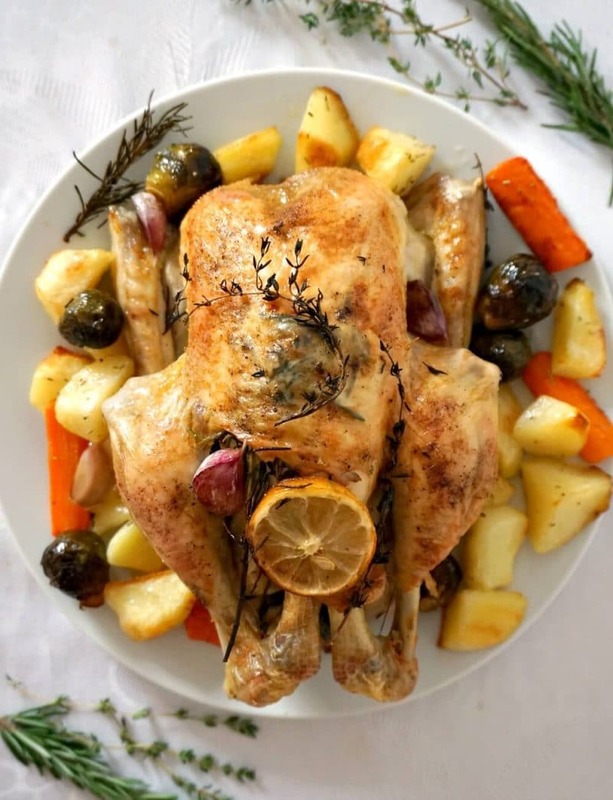 Pre-heat the oven to 230 degrees Celsius, or 450 Fahrenheit, roast the chicken for 20 minutes, then lower the temperature to 180 degrees Celsius (356 degrees Fahrenheit) for the remaining of the time. Having an oven with a timer helps massively, otherwise, just set an alarm so that you can get the timings right. Cooking it on a high temperature to begin with ensures that the skin crisps up beautifully, and gets a nice colour. Baste it a few times while it cooks, that also helps keeping it nice and moist. Once roasted, leave it to rest for at least 15 minutes, then you can carve it. Right, now let’s move on to seasoning and getting the chicken ready for roasting. 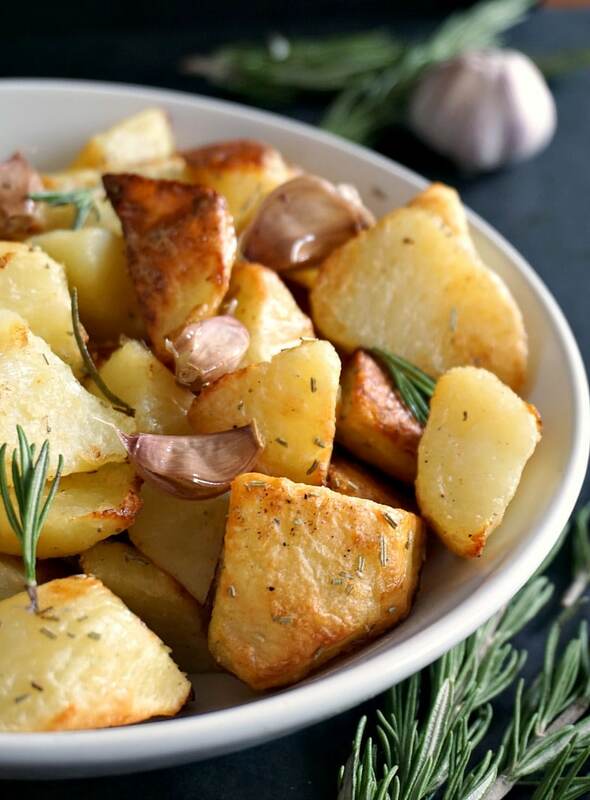 If you want a simple roast only, salt and black pepper are not to be missed, but then we need some more flavour. Herbs like rosemary and thyme work wonderfully well with chicken. They bring so much flavour, and make the chicken really tasty. 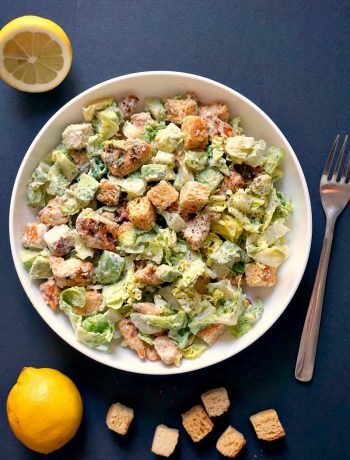 Lemon and garlic are another perfect addition. I would advise you not to peel the garlic cloves, since it’s going to stay in the oven for such a long time, the garlic will burn and become bitter. Unpeeled, it will roast beautifully, I absolutely love roasted garlic. I like adding some lemon slices, some garlic cloves and herbs inside the chicken cavity too, as well as on top of it and around the roasting tray. You can use oil with a high burning point, or the good old butter. Throw some inside the chicken cavity, then use a sharp knife to make a small incision in the skin, then use your hands to loosen the chicken skin away from the breast. You can then place some dollops of butter in there, and some herbs too. That will help keep the chicken flavourful and moist during roasting. I prefer leaving the chicken legs tied with the string during roasting, so that it can roast evenly. Plus, if you use stuffing, that will help keep it inside, rather than all over the tray. You can remove it before serving, it will look a lot nicer without it, in case you decide to carve the chicken at the table. A good roast needs a good gravy. I must admit that when l first came to the UK, I had no clue what gravy was. The idea of using the juices that are left in the pan after roasting to make a sauce seemed peculiar, and I was reticent about giving it a try. I was clearly missing out big time, it is absolutely delicious. Now I cannot think of roast without gravy, the two of them go hand in hand like best buddies. Here are some more gravy recipes to take that juicy roast to a whole new level. To have a complete meal, we need some tasty side dishes to go with our roast chicken. Plenty of choices here, from roasted root vegetables, mash, greens, salads, you name it! Whatever takes your fancy, go for it. I prefer not to roast the vegetables together with the chicken, as the chicken juices will make them mushy. Better roast them separately. So, that’s how to roast a whole chicken to perfection every single time without a fail. Home cooking cannot be beaten, it’s healthier, it brings the family together around the tables, it’s delicious, and such a fun! 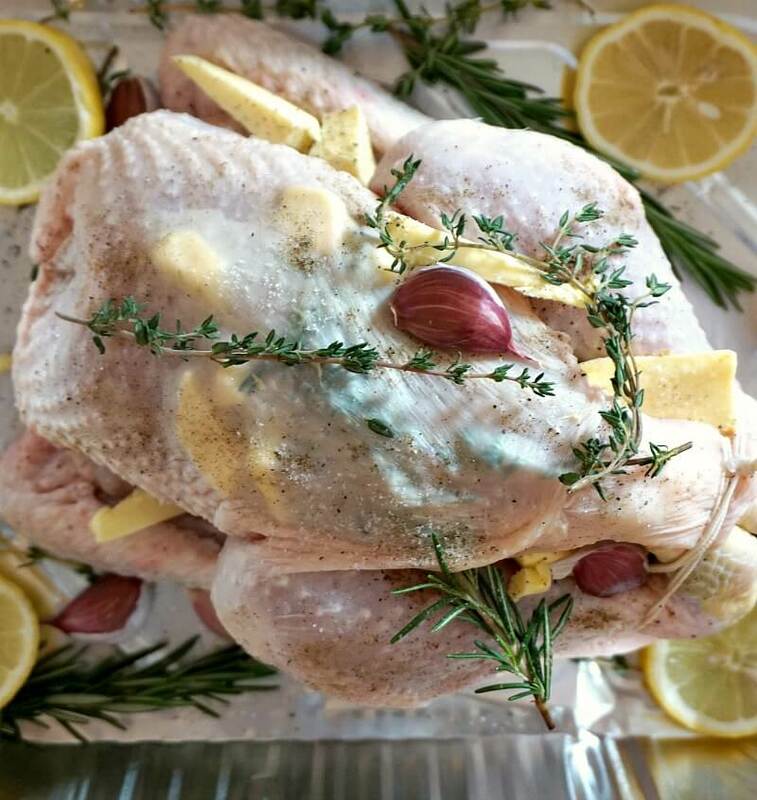 If you’ve liked my HOW TO ROAST A WHOLE CHICKEN or any other recipe on the blog, then don’t forget to rate the recipe and let me know how you got on in the comments below, I love hearing from you! You can also FOLLOW ME on FACEBOOK, and PINTEREST to see more delicious food and what I’m getting up to. Learn how to roast a whole chicken like a pro. Deliciously golden, with roast potatoes, carrots and Brussels sprouts on the side and a fantastic gravy, this roast chicken is the best family meal for any celebration. Pre-heat the oven to 230 degrees Celsius (450 Fahrenheit). 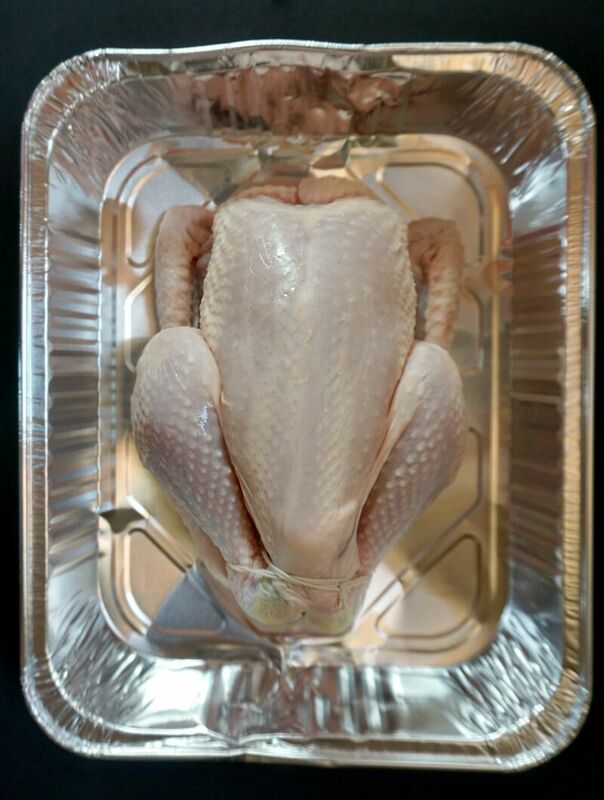 Arrange the chicken on a disposable roasting tray and season with salt and pepper. Use a sharp knife to make a small incision in the skin, and use your hands to separate the skin away from the breast. Place a few butter cubes and rosemary and thyme sprigs. 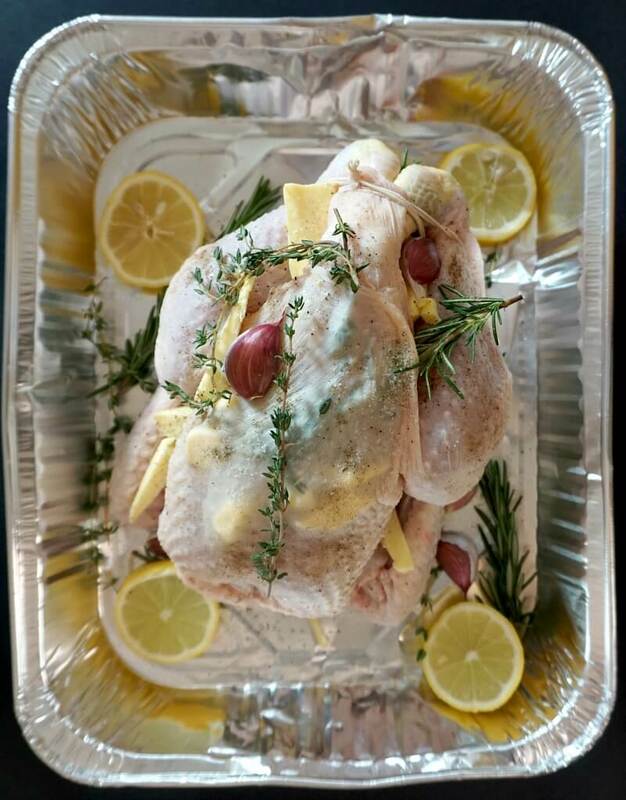 Add some herbs and lemon slices inside the chicken cavity, along with some more butter, then arrange the rest of the lemon slices and herbs on top and around the chicken. Roast for a further 55 minutes, basting the chicken a few times during roasting with the chicken juices from the pan. Once cooked through, leave to rest fro 15 minutes before carving. To make the gravy, transfer the juices from the tray into a pan, add the flour and chicken stock togeher with 400 ml water (13 oz) and stir for about 5 minutes until it thickens slightly. Pass through a sieve to remove any bits that might have been left from the chicken. 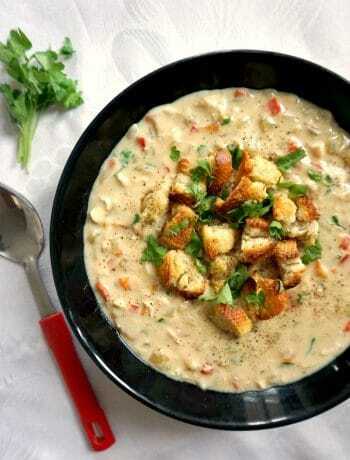 Serve with roast chicken with the side of your choice and gravy. The cooking time will change depending on the size of the chicken, please see the post for more tips.